It wasn’t the fault of artistic angst, but Dear Dr Chekhov has taken a little while, a few years in fact, to reach the airwaves. The one-hour Soundproof program and half-hour weekly RadioTonic program make up the Creative Audio Unit, the site of creative radio-making at ABC RN. The CAU’s focus is on emerging writers and radiomakers, short radio fictions, documentaries and sound experiments. The CAU’s focus is on emerging writers and radiomakers, short radio fictions, documentaries and sound experiments. I was lucky to be working with Jane Ulman over the past couple of years on the production of the drama. The work began and continued during a period of restructuring at the national broadcaster. Quite a few of the experienced radiomakers and once familiar programs are now well and truly gone. New programs such as RadioTonic, Soundproof and Earshot are broadcasting great radio but with much leaner production staff. The Creative Audio Unit’s Executive Producer, Julie Shapiro, came in on the DDC project only last year when the CAU launched, supporting the project through to its premier last week. (Shapiro is now leaving again for a new position in the US.) Our first conversations included plans for the listening party, an audio event style which Shapiro had championed in her years at the Third Coast International Audio Festival. In Melbourne last year, local poddies gathered to hear the final episode of the compulsive radio documentary serial, Serial. ‘”This has been quite a solitary experience, a solitary addiction,” MC and radio host Jess McGuire told The Age/SMH on the day. “Finally you’re in a room with other people – think of it as a support group.”‘ Aden Rolfe launched his RadioTonic serial, A Thoroughly Wet Mess with a listening party at the Golden Age Cinema. Even Keith Richards threw a listening party recently for his Crosseyed Heart album release. The listening event with the artiste in attendance is the new thang. The Federal Government’s funding cuts of recent years have dug deeply into radiodrama at ABC RN, and were a significant contributing reason for the stops and starts in the production of DDC. It seemed that each time the script was ready to go into production, the broadcaster needed to again rethink, restructure and retrench. More recently, the Australia Council for the Arts has been destabilised and defunded by Minister for the Arts, George Brandis. While two dozen of our major performing arts companies will be left unaffected in the short term, smaller companies and individual artists will bear the brunt of the changes many argue, including Steve Dow in the Saturday Paper. These changes threaten the longer term development of writers’ skills, craft and capacity to bring imaginative, innovative works to completion. And thus the longer term ‘health’ of the larger companies. For writers, the situation is especially grim. Not only are we adversely affected by the cutbacks to two major supporters of writers, the ABC and the Australia Council, the book industry is suffering from shrinking markets and sales. Don’t be fooled by the plethora of writers’ festivals we host in Australia. Bums on seats are not equalled by book sales. These changes threaten the longer term development of writers’ skills, craft and capacity to bring imaginative, innovative works to completion. Dear Dr Chekhov is a rich and complex sound work with a text that was written with support from the Australia Council for the Arts. The sound-scape that Ulman has created for the production is, I believe, amongst her best work, orchestrating music and sounds – literal and imaginary – recorded specifically for this production and over Ulman’s years as a radiomaker. She is a sound poet: just listen to the infusion of violin and sonic hum that sweeps you into the first words of the actor Ella Scott Lynch’s narration, the hum continuing while sea birds, violin and sighs drift through the narrator’s words. How is this different to sampling? A guest at the DDC listening party asked me, did Ulman and I raid the ABC’s sound archives? No, we didn’t because Ulman’s sound library is of her own making. It’s a collection that is peculiar to her ear and artistry and the needs of the many productions she has worked on. DDC invites you to imagine two distant islands through sound and narrative. Russian, Japanese, Scottish, Malayan and Australian voices, songs and languages intermingle in this sonically and theatrically rich piece. Birds cry, chains clink, a violin weeps, and a girl is wooed by a man who speaks in haiku. Two islands, and two census takers speak across one Pacific Ocean. 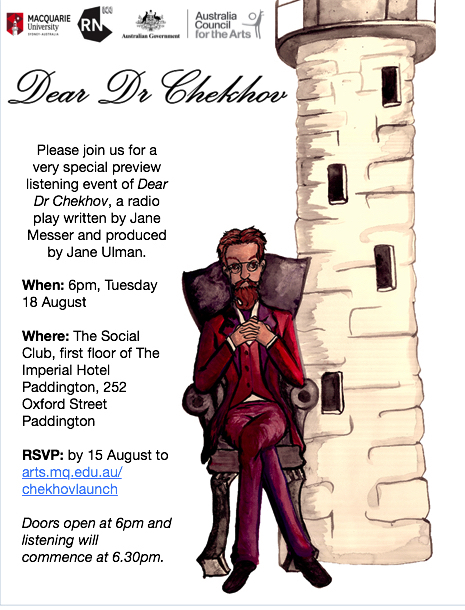 Dear Dr Chekhov tells the imaginary story of the Russian writer Anton Chekhov’s epistolary friendship with Phoebe Jane Phillips, a lighthouse keeper’s daughter who lived on Lady Elliot Island, on the Great Barrier Reef. The action takes place while Chekhov is at work on cold Sakhalin Island, an island that lies just north of Japan. Much is known about Chekhov’s time on Sakhalin, but much less about Phoebe Phillips. According to her island gravesite, she died at age 30 in 1896 of a cold. She would have been a young child when the island’s valuable, phosphate, potassium and nitrogen rich guano was being mined by Arundel & Company in the 1870s. By the time the miners left, the surface of Lady Elliot Island lay two metres closer to sea level. The trees were gone and only the lighthouse stood tall. A harsh life for her, for them all, indeed. Meanwhile, during the late 1880s, Chekhov was honing his craft and gaining recognition as a short story writer. He had also written a few short plays including the comedic On the Harmful Effects of Tabacco and an untitled play commonly known as Platonov (and adapted by Andrew Upton for the Sydney Theatre Company as The Present). He was yet to write the theatre he’s so well known for today, plays such as A Doll’s House and The Seagull. Then, in April 1890 and to the consternation of his family and friends, Chekhov set off across Russia — by train and foot and horse and cart — to the far east island of Sakhalin, a penal colony that was home to 10,000 exiles and convicts. His purpose was to undertake a census of the convicts and to shake off a lassitude and depression that had been troubling him for some time. In both these ambitions he succeeded. He conducted an exhausting yet also exhilarating and politically effective census of the island’s 10,000 convicts. His report, The Island of Sakhalin, based on the census and his observations, was a work of extraordinary sociology. It contributed to changes in Russian policy toward the penal colony. In it he also observed the lives of the indigenous peoples, including the Nivkh (Gilyaks) in the north and the Ainu people to the south. If only guano had come to the north Pacific island of Sakhalin. 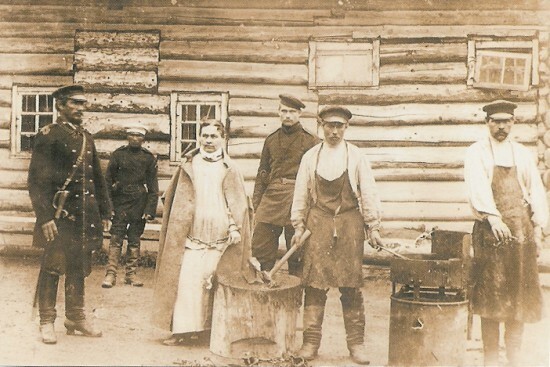 Sakhalin provided very poor agricultural land, and the convicts and administrators struggled to be self-sufficient — which resulted in mass starvation. Once guano (seabird droppings) had been discovered to significantly improve crop yields, it quickly became a valuable commodity (though not in Russia). 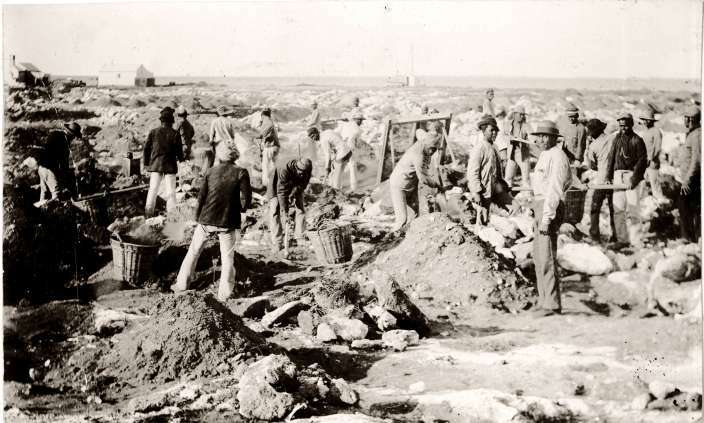 During the worldwide guano boom of the 1800s, guano was mined extensively on Peru’s Chincha islands, Chile, Hawaii, parts of southern Africa and the islands of the South Pacific. Nauru’s century of wealth began with Albert F. Ellis’s recognition and testing of its phosphate ore dense rock. Today, with the phosphate exhausted, Nauru is an environmental wasteland. The Great Barrier Reef was mined. Through to the 1940s the Reef’s islands, cays and coral reefs were worked: Raine, Lady Elliot, Lady Musgrave, North West and Holbourne Islands experienced intensive mining for guano and rock phosphate, and guano extraction took place at Upolu, Oyster and Michaelmas Cays up to 1940. The miners, men from China, Malaya, the Phillipines and Japan were indentured, and sometimes enslaved. Many died working, and never returned home. Others migrated and resettled. 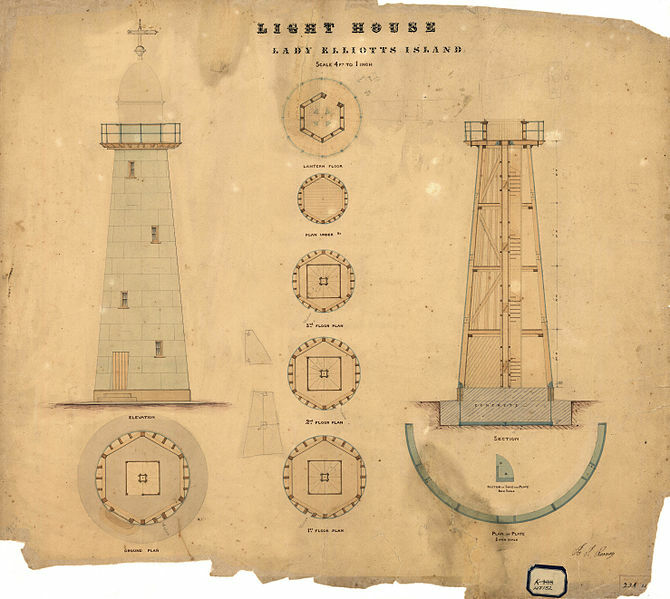 Like all lighthouse families, Phoebe Phillips led a life of severe isolation on Lady Elliot. If she had been older during the years of mining, she might have sought the company of the island’s visitors and workmen. The indentured Malayan, Chinese and Japanese guano miners, who worked the islands of the Great Barrier Reef and the south Pacific, along with the ship’s crew led by Arundel & Co’s Albert F. Ellis, would have been a potential distraction from everyday routine. In Dear Dr Chekhov, the play takes these facts, and with the approval of the fictional Pan-Pacific Ocean Friendly Society, and for the pleasure of the audience, ensures that all the action takes place in the one year, 1890. The two islands have fared differently. The tiny coral cay that is Lady Elliot Island is again treed with pisonia and casuarina and populated by seabirds such as noddies and frigates, turtles and other land and sea fauna and sea flora. While the cay remains low to sea level, the birds that populated it for thousands of years have returned. Guano is back. Sakhalin Island is today the site of one of the world’s largest gas and oil mines. Particularly threatened is the endangered Western Pacific Great Whale. The indigenous Evenk, Nivkh, Nanai, and Uilta communities have protested the damage to their traditional way of life. Fish stocks, pastures and forests have been damaged and destroyed. That we are now living in the geological and cultural epoch of the Anthropocene (the notion that the current geological age is significantly influenced by human activity) is receiving increasing recognition. Dear Dr Chekhov tells a little of that story and asks questions about the ways that we live on and use islands for human purposes. 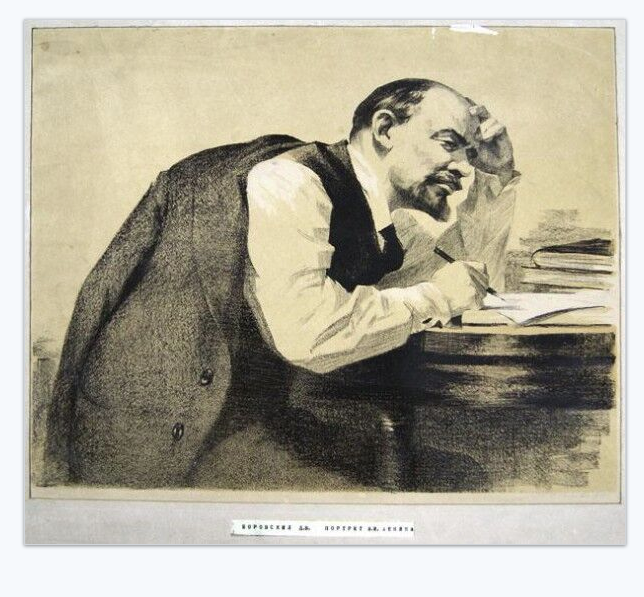 Posted in The Writerly Reader blog and tagged Anton Chekhov, Australia Council for the Arts, Creativity, guano, Lady Elliott Island, radiodrama, Sakhalin. Bookmark the permalink.